New arrivals at Khazer camp, a safe haven for over 6,000 Iraqis who have fled the fighting in Mosul, just 45 kilometres away. 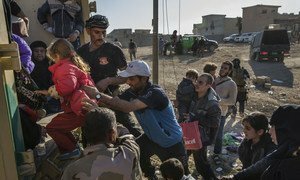 Since operations began to retake the Iraqi city of Mosul from the Islamic State of Iraq and the Levant (ISIL) two months ago, some 114,042 people have been displaced and as many as one million are out of reach of humanitarian assistance. According to the latest report from the UN Office for the Coordination of Humanitarian Affairs (OCHA), the ongoing conflict has rendered it is impossible to state a definitive estimate on the number of people who are still living in ISIL-controlled areas. However, the humanitarian community is concerned that conditions for these communities are deteriorating, as basic goods have not been replaced in western parts of the city since the city’s supply routes were closed last month. Of particular concern is the safety and security of children, as more than 50,000 have been affected due to the Mosul military operation and surrounding conflict. Hamida Lasseko, Deputy Representative of the UN Children’s Fund (UNICEF) in Iraq, told UN News that the agency is working with the Iraqi Government to provide basic services, psychosocial support, and education to children. “This is going to be our main area of focus – to advocate for the education of children. This will also help to keep the children safe: they will be protected from being recruited, affected from the armed conflict, and they will also be able to access their basic rights,” she said. For those who are now living at camps, humanitarian assistance includes basic services such as clean drinking water, latrines, medical assistance. OCHA emphasized that providing new plots to accommodate people who have recently fled is an urgent priority: just last week, an additional 10,170 people were displaced. However, security incidents have threatened aid operations in eastern Mosul. On 22 December, three suicide car bombs exploded in Gogchali, an area on the eastern outskirts of the city adjacent to the main access route. These explosions were in addition to mortar fire that killed aid workers and beneficiaries. just a few days earlier, as well as a significant uptick in trauma injuries over the past month. Meanwhile, flooding due to ongoing rains has threatened water safety, and the arrival of winter brings dropping temperatures and harsher conditions. UN agencies and stakeholders are working to ensure that civilians have adequate protection from the cold, and one NGO is building a field hospital to shorten ambulance journeys and reduce pressure on Erbil hospitals.